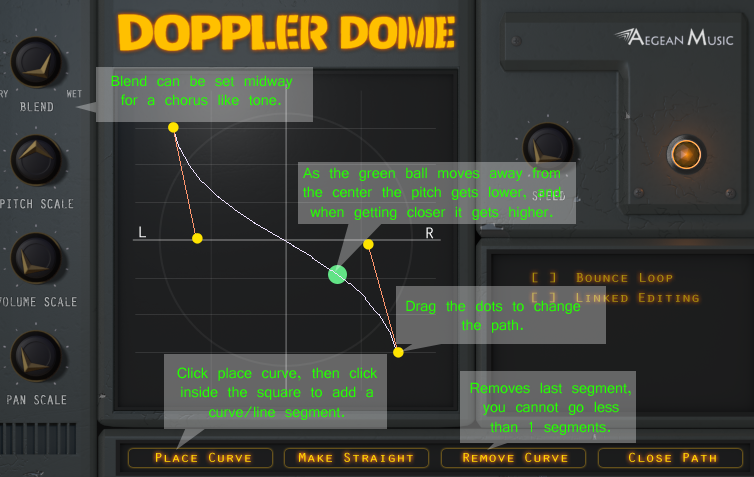 Doppler Dome is a free audio plug-in based on the Doppler effect. Explained simply, the Doppler effect is something that happens to sound when the listener and the sound source are getting closer together or farther appart. For example, a car sound when you are in the car might have a particular frequency, but the frequency will be lower if the car is moving away from you, and will be like a record played at a lower speed. If the car passes right by you it will be high as it gets closer and then low as it gets farther. Doppler dome lets you adjust the amount of the pitch effect as well as pan and volume based on distance.Note that just as sound takes time to get to the listener the output may be slightly delayed based on distance and Pitch Scale, and that any pitch shift is a tempo shift as well. In Doppler Dome, the center is the listener and the sound source moves along a path. Drag the dots to adjust the path's bezier curves. The path can act like an LFO, or a loop. A midi note in message sent to the plugin will reset the path position to sync it with the project. The Blend will mix the pitch effect with the dry signal, this is a bit like a chorus or modulated delay. The Pitch Scale knob determines how much pitch is affected, it can be turned off by setting it to zero. The Volume Scale Scale knob determines how much volume affected, based on distance. The Pan Scale Scale knob determines how much L/R position is affected, based on left and right position. The buttons and switches can be used to set up curves and lines for the path (mouse over them to see their description). Doppler Dome is a free plug-in from Aegean Music, this is the full version. Get news from Aegean Music and the business owner of Aegean Music. Your address will not be shared with 3rd parties. You may unsubscribe any time. Website content and products are copyright 2019 and property of Aegean Music. All rights reserved.